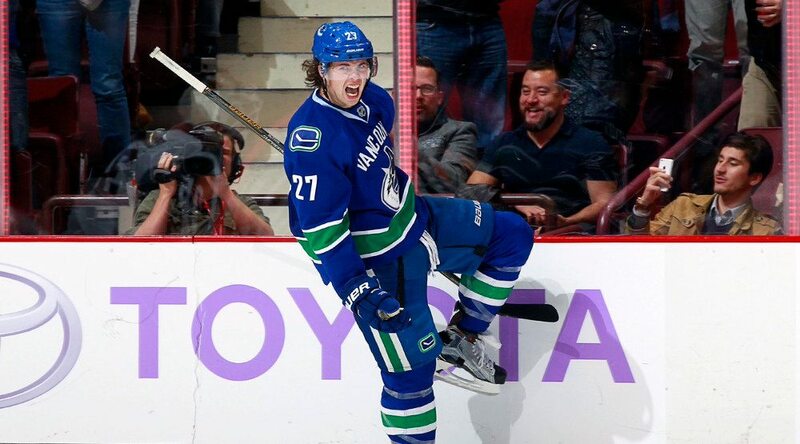 The Canucks have re-signed defenceman Ben Hutton to a two-year contract extension worth $2.8 million per season. Hutton burst onto the scene last season in his first year of pro hockey after spending three seasons with the University of Maine. The former fifth round pick not only surprised people by making the Canucks out of training camp, but also by being a key contributor. At season’s end, he won the Babe Pratt Trophy awarded to the team’s best defenceman. Hutton led all Canucks defencemen in scoring last season with 25 points (1-24-25), and is tied for a share of the lead this year, albeit with a modest total of 4 points (2-2-4). He also leads the team in smiles per minute. After last season, he was selected to play for Team Canada at the IIHF World Championships. Hutton is in the last year of a deal that pays him $925,000 and was set to become a restricted free agent at season’s end. A two-year deal at a $2.8 million figure is a safe move and a fair deal for both the player and the organization at this point, although they could have opted for a more boom/bust long-term deal given his age. The Canucks have opted for a bridge deal for the 23-year-old smooth skating defenceman, which is an interesting decision. Hutton is cheap, but somewhat unproven at this stage of his career. Signing him for longer term (say 4-5 years) would theoretically save the team money down the road, but could come back to haunt them if Hutton doesn’t develop into the player they think. The long term deal approach is something the Canucks are hoping to do with Bo Horvat, as reported by Sportsnet’s Dan Murphy. #Canucks GM Benning says management group will now focus on Horvat and they'd like a long term deal there, not bridge. At this point in his career, the sky is the limit for the 6-foot-2 Hutton who has good size, skating ability, and hockey smarts.